This is the most unusual and useful cookbook available for Northwest seafood lovers. Where else will you learn how to prepare delicious dogfish, lovely limpets, super shrimp, as well as salmon, halibut, rockfish, sturgeon, shad, smelt, ling cod, crab, clams and dozens of other Northwest seafood specialties. 320 delicious, unusual and fun recipes for popular and exotic Northwest seafood specialties. 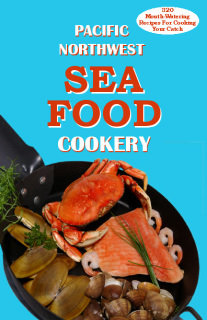 Pacific Northwest Seafood Cookery guides readers through the often-confusing, bewildering processes of how to clean, shuck, scale, steam, slice, fillet, peel and otherwise prepare the exotic and delicious Northwest seafood required before the cookin'. Northwest Seafood Cookery is a practical kitchen guide to transforming the Northwest's own, unfamiliar sometimes strangely-appearing delights into delicious dinners. Included with mouth-watering recipes for salmon, halibut, rockfish, cod, clams, oysters, crabs, mussels, shad, shrimp, smelt, and sturgeon, is what may be the only cook book daring to explore such Northwest specialties as, sea cucumber, bull kelp, crayfish, smelt, dogfish, and scallops with a generous dash of casseroles, sauces, stuffings, smokings and soups. Spiral-bound, lies flat for easy kitchen reference, Pacific Northwest Seafood Cookery is a comprehensive seafood guide for cooks from San Francisco to Anchorage.